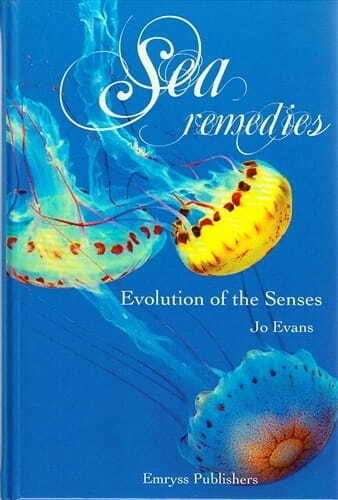 Sensory evolution provides a stunning, full-colour illustrated guide to the marine invertebrate remedies used in homeopathy. Alongside the materia medica, additional chapters explore the evolution of the senses and the relationship of our human sensory experience to that of this group of early animals. The conventional biomedical uses are also included. With 24 remedies in 653 pages and around 100 full-page colour illustrations, this book has quality and size. It is surprisingly slim, heavy, perfectly bound on high-grade paper with an elegant font and a great aesthetic; the central materia medica section has a shaded marker on the edge of the page so you can find it. The first 125 pages set the tone with the sensual themes. Will we ever feel at home with these families? In this book I think so, it is an underwater adventure with correspondences, taste, smell, vision, touch, hearing all analysed, indexed and referenced in such an elegant and poetic fashion that I think the author has been writing prose all her life without knowing it. Each remedy is summarised before being described in detail, with some cases from our literature. Porifera, cnidarians, echinoderms, arthropods, molluscs, gastropods, bivalves, cepaholopds ... there is a new unfamiliar vocabulary to help define familiar remedies like Calcarea carbonica and Sepia, and new remedies like Eledone cirrhosa or Pecfen jacobaeus. Then there is a spiral journey of homeopathic process, integrated with spiral and shell remedies. There follow glossaries of the unfamiliar terms and a thematic repertory, bibliography and index, as part of these last 100 pages. It looks good enough to eat - about the only information that seems to be missing is this: the sea creatures so lovingly, carefully and comprehensively described in this book are a forbidden food for observant Jews on a par with pig meat. Oh and there are no recipes. I look forward to the second volume that I hope will deal with real vertebrate fish with fins and scales. Desires fish (3). This is a superlative book in every way, the sensual medium is the message, not only for look and feel but for quality and integration of the information about the medicines. I have never seen a materia medica with so many sources and so much integration of philosophy with useful material. I have a habit of reading an article from a journal or a remedy from material medica in bed most nights. This one is taking me longer as it is so rich and I look forward to more early nights. Buy it for yourself or ask someone dear to you to give it for your next birthday. From one marbled inside cover to the other, this book is a work of art. It is also an unusual work of great erudition, encompassing materia medica of all the known marine invertebrate remedies and searching for the themes and sensations that will help us understand them better. As life evolved in the ocean so did the senses of the creatures that lived there, and the sea still provides living relics of all stages of evolu­tion. In the first part of the book Jo Evans goes through the senses of Smell and Taste, Touch, and Vision and Hearing one by one: all had their antecedents in simple animals not yet possessing specific sensory organs. The skin of the cnidarian phylum (including the hydra, jellyfish and anemones) contains differentiated cells that respond to light, smell and taste as well as vibration and movement. Even sponges employ a kind of chemical signalling and can respond to touch and movement without having anything that could be defined as a nervous system. Sponge cells can also reconstitute themselves after being crushed, and can change function as required. As you can imagine, medical science is exploring the use of these capabilities in the development of treatments for people. There is still much to learn. Coral controls its immediate environment through managing the light available to the algae that live in it and feed it and, when the reef needs to cool down, the algae release dimethyl sulphide thereby promoting cloud formation and possibly rain. As Jo says, 'This is powerful communication and feedback in an animal with no brain, and certainly challenges the idea of brainpower in evolutionary terms'. And there is more of this stuff - all challenging to our preconceived ideas and, quite simply, amazing. As we travel through the families of sponges, jellyfish, starfish, lobsters, molluscs and cephalopods, reference is made to remedies from those groups and correspondences drawn. The advent of shells brings seclusion and safety but also imprisonment and alienation. These polarities and the sexual aggres­siveness of lobsters are reflected in the proving of the remedy Homarus, for example. These introductory chapters could almost be a book in themselves but, in fact, form about a fifth of the total. The main part consists of an exhaustive materia medica of the 24 remedies. Consider the materia medica of Conchiolinum: - we learn about the chemical composition of mother-of-pearl and the fact that both Avicula margaritifera and oyster shell have been used to make the remedy. There are clinical symptoms and a proving. Proving symptoms indicate wave-like moods, guilt and loneliness and an affinity with the bones. Comparisons are made with the Calcareas, Cypraea eglantina, Pearl, Lapis albus, Carcinosin and Hekla lava. There are two cases quoted and then a history of poisoning symptoms experienced in mother-of-pearl button factories, its medical use as a stimulus to bone growth and its industrial uses. It is used in crystal therapy and Chinese medicine. The Navajo and Australian Shamen also have legends concerning it. Essential themes concern nurturing, mothering and spirituality as well as the bone disorders. Each remedy is considered in this kind of depth. The last part of the book is called Spiral Journey and is divided into two parts: 'The Homeopathic Process' and 'Spirals and Shell Remedies'."... the spiral appears wherever there is life, growth and movement', writes Jo, and points out that the self-similarity and repetition of pattern make the spiral a relevant symbol for homeopathy and the developing self. The caduceus mirrors the double helix of DNA. The discussion moves on to 'non-dual duality' and the relationship between 'essence' and 'vital force' and the implications for 'similarity' and 'polarity' in homeopathic philosophy. I have to confess that I found this part rather difficult to follow as it wanders off into romanticism, scientific innovation, the impor­tance of left / right brain activity and the role of the anomaly in scientific breakthroughs and in homeopathic practice. The second part considers the correspondence between psyche, soma and substance that is central to homeo­pathy and extends it to 'signatures', which involves some discussion on the nature of consciousness and evolutionary memory. Difficult stuff, as I said, but quite important if looking at the sources and natural history of our remedies has any point at all. Finally the author returns via myth and symbolism to a review of the shell remedies in the context of 'integration', integration of above and below, left and right, male and female, reason and intuition - integration represented by the spiral. The book ends with an 18-page thematic repertory. I did originally intend to compare this book with Survival: the Mollusc by Sankaran and Baldota, which I reviewed in the Summer 2009 'animal' issue of Homeopathy in Practice, and found a bit disappointing. However that would be an impossible task. Within the materia medica of these two books, the conclusions about themes and essences often differ even when based on the same proving, as with Cypraea eglantina (dog-rose cowrie) - no doubt reflecting a different way of looking at cases - but the books also vary considerably in scope and depth and, of course, in the range of fami­lies covered. Both emphasise natural history and historical and medical usage, this one has a five-page bibliography, the other has none. Sea Remedies brings illustrations worthy of any coffee table to a wide-ranging academic tour de force. Whether your interest is evolu­tion, mythology, symbolism or detailed prov-ings, it is all here fully researched and referenced. Contains: Materia medica of twenty-four marine invertebrate remedies. Plus: An exploration of the evolution of the senses, beginning with the sensory systems of marine invertebrates. Taste, smell, vision, hearing and touch are explored in individual chapters. Each chapter ends with an appen­dix of the relevant sensory symptoms for the corresponding homeopathic remedies. It seems so long ago, Sepia was alone... How many sea remedies did we know, 25 years ago? How much about them? Leo­nard Cohen's sad song could have been sung about our knowledge of sea remedies before homeopaths decided to swarm out exploring the universe of the oceans. Some of the presented remedies you may not have heard of so far. So - is this one of the new age books pub­lished prematurely where you cannot de­cide between fact and fiction, between in­formation and speculation? Glad to say: No, it isn't. Jo Evans, a London practitioner, makes clear where we are. We are guided, not misled. More than 100 pages introduce us to the senses of these beings, after which it is hard to call them just "remedies." Look at the squid on page 617. This thorough investiga­tion is of relevance to the homeopathic prescriber: the sensual abilities of the beings express themselves through the symptoms of the remedies. A bunch of lonesome symptoms? The next 500 pages are filled with 24 rem­edies: A lot of new remedies which I will hardly ever use, because I see just a bunch of symptoms, cured and proven ones, and I am not able to see the differences? Glad to say: No, it isn't. Jo Evans provides us with symptoms, provings and cases, all sol­id information. The author is clear about the remedies. She compares them, subtly and carefully. Remarks on differentiation run through the book. The closer you get the easier you are able to see the differ­ences. Diamonds in the mine Will I ever need Limulus, Acanthaster or Toxopneustes, Chironex and Cypraeal? Maybe not. Maybe tomorrow. They are jew­els, anyway. Once you look at the pictures, you will not end a chapter before you know more about this creature. This book is a work of years, dedicated to collect, to evaluate, to write. It is not a work of a single genius, but a beautiful example of networking. Networking is one of the lessons we homeopaths have to learn be­fore we call ourselves scientists. Future homeopathic books will be measured against this one. We look forward to reading your next book, Jo.